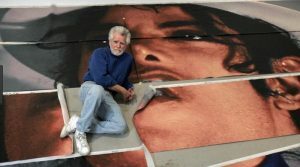 Kent Twitchell, internationally famous artist for painting monumental sized murals of “American Cultural Heros” feels his greatest masterpiece is a collaborative creative effort he had with The King of Pop, The Most Famous Man in the World, Michael Jackson when they made together a painted monument mural to legitimize the pop star’s legacy in 1992. This passionate project of creating the exciting 100 ft. tall project of MJ by KT was painted in acrylic on a polyester fabric, to be adhered to the side of a 12 story building. At one point, Michael Jackson’s entertainer genius creative mind wanted to make it an interactive mural on the side of a building with lighting affects and lasers. But that idea was quashed by the city of Hollywood in 1992. Instead of becoming a famous destination of public art of perhaps the most beloved music genius of a generation… or perhaps several generations, worthy of making any building noteworthy on an international level, it has languished forgotten in storage rolled up on small tubes for the last 24 years. After Michael’s death in 2009, the project was abandoned by the family, estate, corporations and legal representation of the defunct musician. This original artwork/painting/mural of the most famous man in the world by one of the most famous contemporary portrait painters in the world is making it’s breakout performance in 2018. With the added visibility and promotion of Michael Jackson – On The Wall at the National Portrait Gallery in London, you should be hearing more about The Michael Jackson Monument in the media this year. FACL is honored to be part of this collaborative effort for the preservation, restoration and installation of this monumental historic public art… no matter where it may be installed in the world! Where will the home for this famous mural be? Tokyo, Hong Kong, London, Rome… Dubai or Hollywood? Stay tuned for more information!!! Like this page! Leave a comment! This could be a BIG deal… I hope the attention goes viral. Cirque du Soleil has a show in Vegas with this image right now. What a great image. I love it. Maybe it could go to Europe or Japan… or Vegas. I hope this mural doesn’t go overseas… it belongs in Hollywood. You are in good company Lilly. There is international interest in this project. It is unbelievable Blake. We are going to have sections of the mural on exhibition, perhaps several shows. I hope you can attend one and see what the 100 ft painting looks like close up. It is very amazing. I agree Vincent. My favorite is the LA Symphony on the 110 Freeway in downtown LA. No one knows this yet, but Kent will probably be adding to the mural in the near future! More to come Tyler, photos of MJ and KT working together. Quite right Penny. Its already creating a buzz. His fan base is bigger now than ever before. The excitement will be world wide. This mural is so unique… it was made together WITH MJ!! I mean MJ was part of the creation process!! Wow!!! Back from the dead! I love Kent’s mural work. His huge murals are all over L.A. and other cities. Let’s add one more!!! I can’t believe this masterpiece has been in storage all these years. This is soooo cool! I’m super excited to see this mural go up on a building!